LPR-001 egg shakers are a classroom and performer favorite - and quite a hit at the Minnesota State Fair! 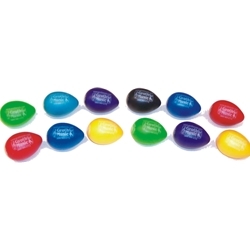 We offer them singly or in this handy value set of 12. They are colorfast, non-toxic, easy to wash and sanitize, and virtually indestructible - our staff has tested them in a variety of creative and catastrophic ways. Constructed of durable plastic and filled with non-toxic steel shot - perfect for players of all ages. Comfortable design provides the quick, delicate and responsive shaker sounds that are desired by studio percussionists worldwide. Hold more than one in each hand to create new sounds and increase volume. Unique construction method ensures they are the most durable egg shakers on the market today. Conforms to U.S. Toy Safety Standards ASTM F963-96A. Approved for ages two and up. Available in red, hot pink, yellow, lime green, turquoise, sapphire blue, purple, and black. NOTE: We will choose an assortment of colors for you. If you have color preferences, specify this in the order notes and we will do our best to meet your request.